H.N.I.C. follows the Sumner House boys; Pappy, Von, Ant and Gee, led by a 5th, Black, as told by Pappy. Pappy has put in his time and escaped alive. Now he wants to get out of the game and try to start anew elsewhere. Black has other plans, forcing Pappy to do one more job with the crew against Pappy’s better judgment. The novella’s gritty, straightforward plot does the heavy lifting while layers of loyalty, anger, addiction, greed, abuse and more are thematically woven into the story. Everything becomes further complicated when we are introduced to Tonya and her relationships with Pappy and Black. Albert “Prodigy” Johnson is no stranger to these kinds of street tales. He has been rapping as half of the duo Mobb Deep since the early 1990s. 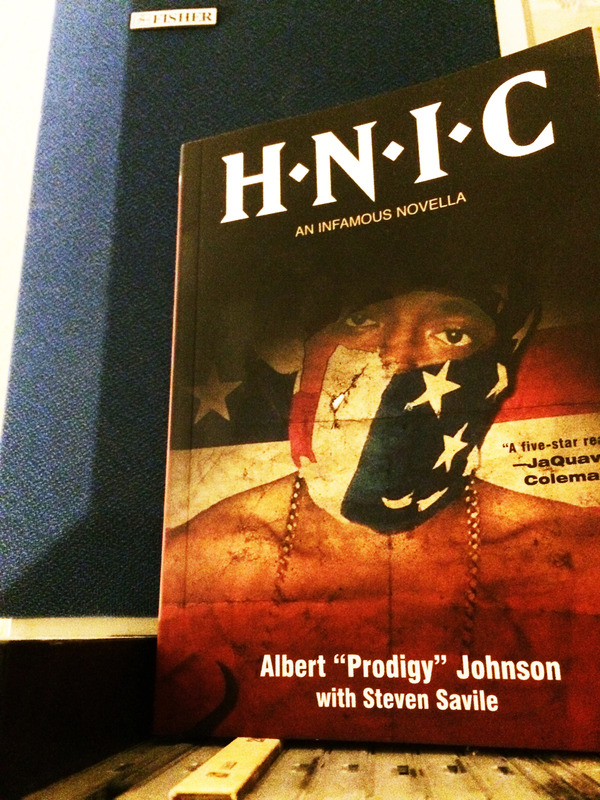 Elliott Wilson wrote of their album The Infamous for “Vibe Magazine”, “Each song is a different chapter in the hard street life Havoc and Prodigy have experienced in their Queensbridge neighborhood … While describing their lives with brutal realism and raw imagery.” But H.N.I.C. is just the first time that Johnson has done so like this (note: this is his 2nd book after 2011’s autobiography). Although he traded in the 16s for prose, his lyricism occasionally shines through, for instance, “heat it up and it gets sticky and sickly and it stops being sugar” could easily be found in a hip hop song with only slight modifications to cadence or pronunciation. The hyper descriptive details that rap’s greats enlist find their way into H.N.I.C. too including technological terms I wasn’t even familiar with. This book is the first release from Johnson & Akashic Books’ new venture: Infamous Books. It sets the tone for the types of releases to expect as they aim to “connect readers worldwide to crime fiction and street lit authors both familiar and new”. Admittedly, I don’t anticipate finding this book on any ‘Best of 2015’ lists or literary prize shortlists. However, the writing gets the job done and allows Johnson and co-author Steven Savile’s story-telling ability to shine through. I, of course, especially recommend this book for any fans of hip hop venturing into the literary world. I did receive a copy of this book from Akashic Books.